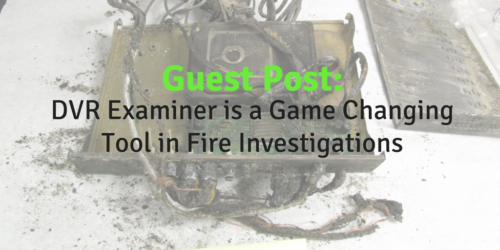 Fire Marshal’s Digital Forensic Laboratory recently acquired DVR Examiner, a new software tool. It’s the first of its kind, and is a breakthrough in the digital video forensics community because it saves video from Closed Circuit Television (CCTV) digital video recorder (DVR) hard drives. If a fire occurred in the proximity of a DVR, there could be video of the fire that may show who or what caused it. DVRs are often damaged in a fire due to soot, water and the control buttons being melted away. Previously, in order to recover the video from a damaged DVR, a DVR of the same make and model would have to house and power the damaged DVR’s hard drive. This was time consuming, expensive, and many times, not feasible. With DVR Examiner, a working copy of the DVR hard drive can be produced, and video can be saved from the copy in its original format as well as a video format that can be played with Windows Media Player. The scope of time that needs to be saved from the DVR, as well as camera numbers, can be selected using the DVR Examiner software. Once the video has been saved, the DVR Examiner produces a report stating which cameras and times have been saved as well as easy access to the saved files. The DVR Examiner also saves fire departments both time and money. Previously, if investigators needed to save multiple days of video from a DVR for evidence, they would have to remain on-site until all the needed video had been saved from the recorder. This was a time-consuming process and a financial burden. With this new tool, days, weeks and months of video can be saved from DVR hard drives much faster. This also builds better relations with the community since home and store owners who volunteer their DVR to investigators can get it back much faster.